Even though corrective lenses (i.e., glasses and contacts) are perfectly fine ways to address vision problems, undergoing refractive surgery is preferable to many people. These special laser surgeries such as LASIK reshape the cornea and allow people to see perfectly clear. No need for glasses, and none of the hassles of contacts. 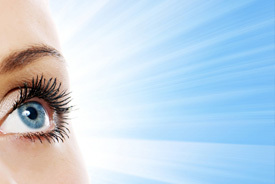 There are some options when it comes to LASIK surgery, however. Advances in technology have led to the development of a highly precise form of LASIK called custom LASIK. The team at our Salinas and Monterey eye care centers would like to take a brief moment to compare traditional LASIK surgery to custom LASIK surgery. We can discuss this in greater detail with you when you visit our practice in person for a consultation. Traditional LASIK surgery was a true revolution--a laser surgery for the eyes that allowed patients to see clearly without the assistance of prescription eyeglasses and contact lenses. During LASIK surgery, a flap is created in the topmost layer of the corneal surface (also known as the epithelium). A laser is used to adjust shape the cornea, allowing light to properly focus on the retina in the back of the eye. Once this is completed, the epithelial flap is set back in place to heal. Patients feel no pain or discomfort during the treatment. Custom LASIK surgery is very similar to traditional Monterey LASIK surgery. In fact, the procedure is essentially performed the same way. There is an important difference, however. That difference involves digital scanning technology. A three-dimensional map is created of the corneal surface, identifying minor flaws. This information is fed into a computer, which then guides the laser during the actual surgical process. When it comes to LASIK, it’s important to know two important terms: lower order aberrations and higher order aberrations. Lower order aberrations are basic refractive errors, such as myopia (nearsightedness), hyperopia (farsightedness), and astigmatism. Higher order aberrations refer to vision problems such as haziness, haloes, glare, starbursts, poor night vision, poor color sensitivity, and so on. As you’re about to learn, these two types of vision problems help show why one kind of LASIK surgery is better than the other. Traditional LASIK is able to treat lower order aberrations with ease, but it is not able to address higher order aberrations with consistency. By contrast, custom LASIK surgery is able to address both lower order aberrations and higher order aberrations, meaning better vision quality for the patient after surgery has been completed. This is all due to the precision of the digital scan of the corneal surface. Our ophthalmologists serving Monterey and Salinas feel that the difference is quite apparent, which is why we’re proud to offer the latest in LASIK technology to our patients. If you would like more information about your various options for vision enhancement and vision correction, be sure to contact our eye doctors serving Monterey and Salinas today. The entire team here is eager to help you achieve excellent vision and answer any questions that you may have about LASIK surgery or other eye care treatments.